April | 2013 | Vikings, Books, etc. Three new earth-sized (only slightly bigger) planets discovered by the Kepler mission–all apparently in the habitable zones of their planets! Two of them in the same star system, even (OK, OK, in Norse mythology we have nine worlds, but not everyone can be as cool as that). I know this is more of a Norse lit./book review website (with occasional cartoons), but running parallel to my science fiction reviews, I like to post about discoveries like this from time to time. And as I discuss in this post, I consider the “liberal arts” goal of expanding one’s mind to be well served by both studying ancient (or other) culture and beginning to grasp just how enormous and amazing this universe is. I don’t have time to give much more in the way of comments now, so I’ll just refer you to that earlier post for some of those ramblings (though one day I will try to pull them together into a more coherent presentation). The video embedded below is from the Space.com report of the discovery, although you can also check out Nasa’s own summary of the discovery, and of course this is being covered all over the web. I am bummed that the planets are so far away–thousands of lightyears–but it is also really neat that we can gather data on such distant systems, and it gives us hope for similar discoveries closer to home. It sounds like at least a couple of these planets (the ones in Kepler 62) are likely covered in world-wide oceans, which is a neat parallel to some of the planets we see in science fiction, from Jane Yolen’s Commander Toad in Space to the planet of the Mon Calamari in Star Wars (also Kamino, right?). I think the planet around Alpha Centauri in one of Isaac Asimov’s sequels to his Foundation trilogy was mostly ocean, but I could be misremembering (but for another mention of that book, check out the post with the “ramblings” which I mentioned above). Odin on his alien eight legged horse. The illustration is from a very late paper manuscript (post-medieval). Karl Siegfried of the Norse Mythology Blog (and jazz musician extraordinaire) will be appearing on H2, the second channel for the History Channel, tonight on their “Ancient Aliens” show. Is there an extraterrestrial connection between the Vikings, their gods, and alien beings (as w/ Stargate)? Here’s a hint from a professional: No. Watch in any case to see Karl go head to head with the aliens. Or those who believe in them, anyway. I’m hoping H2 will put it on the web later, so I can link to it or embed it here. My impression of the sort of documentaries you get on the History Channel, Discovery Channel, etc, is that they may be entertaining (occasionally), but they are hardly interested in education. Conspiracy makes for better business than the truth, and, paradoxically enough, the idea of historical truth makes for better business than historical truth itself (OK, bracketing off for the moment the epistemological/ideological complications that come along w/ using a word like “truth”). If you want to learn, the best bet is to take a course, and then continue from there, having “learned the ropes.” That said, there is a lot of introductory material out there for beginners, written by world-class scholars in the field (as I have noted many times), so don’t feel like the university is your only option for learning! Check out my “Book Reviews and Recommendations” category for posts in which I cover books on the Viking Age, Norse Myth, etc– as well as a bunch of Science Fiction and pretty much anything else I find interesting. More posts will be coming as time goes on–it was recently recommended that I give some recommendations for reading about life in the Viking age, but in the meantime you can get a few samples in my initial reaction to The History Channel’s Vikings Miniseries. I’m afraid this sort of paleography/codicology is not my speciality, although I think it is both fascinating and essential to our work with medieval texts (although I did attend the Arnamagnaean Institute’s paleography summer seminar two years in a row, and got to work with the manuscripts and their facsimiles a bit while I was writing my dissertation–would like to do more of that).The nitty-gritty sort of work that gets done with the books themselves is pretty important both to our understanding of the culture in which they came to be, and to our interpretations of the manuscripts themselves. 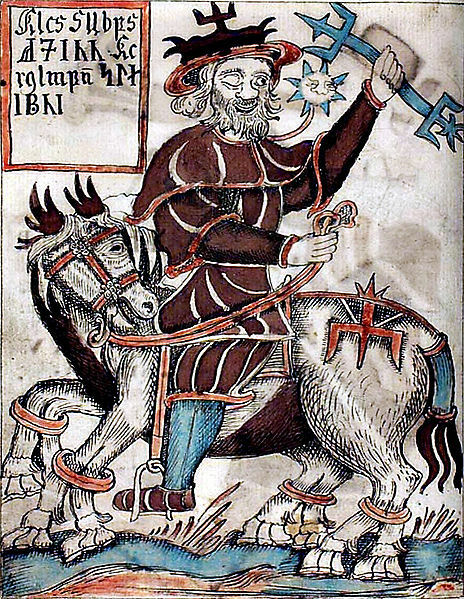 Speaking of common models for the art in manuscripts, in the course of my dissertation research I found out that the illustration of Gylfi interviewing High, Just as High, and Third in the Uppsala MS of Prose Edda is actually based on an illustration from one of the king’s sagas (or vice-versa–I’m afraid I don’t remember which is the case, or which MS the other illustration is found in–it was a few years back, and I didn’t do anything with this fact in my dissertation). Just a little detail, but fun. The fact of the illustration is itself interesting as the other medieval manuscripts of both Eddas are quite plain (and Uppsala Eddan isn’t much better). It is a stark contrast with the richly illuminated Flateyarbók (a history of the Norwegian Kings, and meant for a king) or religious texts–not that you find oodles of rich decoration through all the other medieval Icelandic manuscripts (not the ones I typically find a reason to look at, at any rate), but I would imagine that one would be less inclined to give the same exalted treatment to the “lies” (as Snorri presents them) of pagan mythology as was given to the more elevated topics of the Norwegian throne and Sacred (Christian) texts. Oh, and if you aren’t sure what the Eddas are, check out my last post (some of my over-simplified metrical explanations possibly to be expanded on at some point… we’ll see).